Named 'Silverstone Classic powered by the AA' it promises to be the most entertaining and action-packed Silverstone Classic yet. Silverstone’s National and new International Wing pits and paddock complexes will be used to capacity to house more than 800 of the world’s finest historic racing cars with an intensive schedule of races all staged on the full Grand Prix circuit. Adding to the spectacle, more than 7,000 classic cars will be displayed over the weekend on the infield with many hallowed marques celebrating important milestones in their evocative histories. Other highlights include live rock concerts, a special star-studded celebrity race, air displays, a vintage fun fair, a host of retail opportunities and rally car rides plus the exciting new interactive AA World automotive theme park. With so much to experience at the Silverstone Classic, it’s no surprise that advance ticket sales are 31 per cent up on the same period last year – itself a record. With a total of 1,104 race entries the 2011 Silverstone Classic is believed to have been the biggest race meeting ever staged anywhere in the world, while the 80,000 attendance was unprecedented in the event’s recent history. 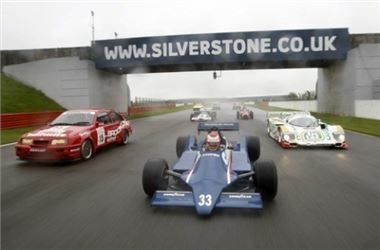 The 2012 Silverstone Classic will host no fewer than 24 races, many boasting full 58-car grids. The line-up includes the finest historic racing cars covering more than eight decades. The wide-ranging race card organised by the Historic Sports Car Club (HSCC) features no fewer than 100 Grand Prix cars plus spectacular grids of Le Mans, GT, Group C, Jaguar E-types, Sports and Touring cars providing the very best of nostalgic race action. There’s also the return of the Jaguar E-type Challenge as well as new races for Formula 5000 and F2 single-seaters and a unique ‘tin top’ race showcasing the cream of the front-runners from European, British and German Touring Car championships spanning the years 1975 to 1999. This grid will also put a special spotlight on the evocative Ford Sierra RS500 Cosworth. The remarkable achievements of two of motor sport’s most respected figures will be commemorated with races dedicated in memory of the late Peter Gethin and Alan Mann. Gethin, who passed away last December, will be remembered not only for winning the 1971 Italian Grand Prix in the closest finish in F1 history but also for capturing the British Formula 5000 Championship in both 1969 and 1970 as well as the Tasman F5000 Series in 1974. To honour these titles, the new F5000/F2 race will bear the revered Peter Gethin name. Also a racer in his early life, Mann’s place in motor sport history comes through the Alan Mann Racing team that he established during the Sixties. Though Mann passed away in March many of his distinctively liveried red and gold saloon and sportscars are still competing today thus keeping the legend alive. Celebrating his team’s achievements – not least in taking three British Touring Car Championship crowns – this year’s Under 2-Litre Touring Car (U2TC) races will be dedicated to the memory of Alan Mann. A special celebrity race starring famous faces from the high-profile worlds of music, sport, media and show business is now an annual attraction – and this year’s Silverstone Classic Celebrity Challenge promises to be the best yet with more big names competing than ever before. Those donning race suits and helmets include: Chemmy Alcott (Olympic skier/ITV Dancing On Ice); Heston Blumenthal (award winning chef); Julia Bradbury (BBC Countryfile presenter); Steve Bull (ex-England football star); ‘Comedy Dave’ Vitty (BBC Radio 1); Brendan Cole (BBC Strictly Come Dancing); Kelvin Fletcher (Emmerdale); Vicky Gomersall (Sky Sports presenter); Tony Hirst (Coronation Street); Brian Johnson (AC/DC rocker); Sir Patrick Stewart (film and stage actor) and Jo Wood (lifestyle guru). As in 2011, the stars will be lining up on a grid of competition-prepared Morgan race cars. Funds raised will support the Bobby Moore Fund, the Birmingham Children's Hospital and both Crohns and Colitis charities. Backed by the Automobile Association ­– the UK’s biggest motoring organisation – AA World is perhaps the most significant new attraction for 2012. Based right at the heart of the venue, close to Silverstone’s impressive new Wing pits and paddock complex, the new AA World motoring theme park will provide show-goers of all generations with an unprecedented line-up of free driving experiences ranging from electric cars for toddlers and taster driving lessons for teenagers to hot laps around the Stowe Circuit in some of today’s latest and most desirable performance cars. With an F1 simulator, pit stop challenges, lessons on how to prepare food for the road, a giant Scalextric track, dodgems, classic car displays plus a host of other attractions, AA World is going to be a fun-filled experience for children and parents alike. Every summer many car clubs choose the Silverstone Classic to celebrate special milestones in model, marque or club histories. After last year’s record breaking parade of E-type Jaguars, this summer witnesses the 50th anniversaries of a number of other much-loved British sportscars, notably the Lotus Elan, Triumph Spitfire and AC Cobra. The Silverstone Classic has also been selected by the MGB50 Committee as one of just three official celebrations to mark 50 years of the much-loved MGB. From the other end of the spectrum, a world record gathering of more than 60 mouth-watering Ferrari F40s will celebrate 25 years of the idolised Italian supercar, rated by many to be the Prancing Horse’s greatest creation. The UK will stage its first-ever BMW ‘Z-Fest’ at this summer’s Silverstone Classic. Organised by the official BMW Car Club GB as one of the highlights of its 60th birthday celebrations in 2012, the UK’s inaugural Z-Fest will see hundreds and hundreds of BMW’s popular Z1, Z3, Z4 and Z8 sportscars on display as well as participating in a special parade lap on the full Silverstone Grand Prix circuit. Operating in conjunction with AA World, Drive.Live. is giving today’s generation of motor manufacturers a chance to display their heritage alongside latest showroom models and also provide show-goers with hot laps in selected models around the venue’s ‘infield’ Stowe Circuit. BMW, Lamborghini, Maserati and Morgan have already jumped at the opportunity to showcase their hottest new offerings to what’s a very discerning audience. Drive.Live. is another of the exciting new initiatives being introduced for 2012 which, like AA World, is all set to become a major attraction in future years. Living up to its ‘Rocking and Racing’ tag, the Silverstone Classic is renowned for its live rock concerts staged on both Friday and Saturday evenings. This year’s impressive line-up includes chart-toppers Adam Ant and Mike & the Mechanics plus guitar ‘supergroup’ Snakecharmer. To get everyone in the right party mood Roy G Hemmings’ Motown Show and the Taking Care of Elvis Show are also on the bill. In addition AA World boasts its own live music shows, while the popular all-female Tetra Electra Quartet will perform amplified arrangements of classical favourites on Sunday afternoon. Following a successful debut in 2011, Silverstone Auctions will be organising the Silverstone Classic Sale with lots on display in the Wing building. The sale will include a diverse and stunning collection of classic cars, modern sportscars, motorcycles and automobilia, giving every motoring enthusiast a reason to attend. Last year's event generated sales of more than £1.3m. Viewing is scheduled for Friday (20 July) and the Saturday morning (21 July) with the auction then starting at midday on Saturday. There’s so much more fun for all ages to enjoy at the Silverstone Classic with a vintage fun fair, go-karts, aerial displays with wing walkers, the Parachute Regiment The Red Devils, hot air balloons, Punch and Judy (celebrating 350 years), rally car and 4x4 experiences plus giant TV screens showing all the on-track action. There is even a pampering centre on the Village Green plus the retail village with nearly 200 exhibitors presenting a wide range of autojumble, automobilia, art, jewellery, books, videos and gifts for everyone. Another traditional Silverstone Classic forte is its widely-praised ‘access all areas’ policy. General admission tickets include free entrance to all live music shows, AA World, trackside grandstand seating and both International and Wing pits and paddock complexes that allow fans to meet the competitors and see many of the world’s finest racing cars at close quarters. Tickets also provide access to an increased number of on-site buses that will provide free transfers between all the numerous attractions. Adult tickets cost as little as £35 if purchased in advance and special two- and three-day weekend tickets are also available. Full details are available via the event’s official www.silverstoneclassic.com website. The photo shows a selection of some of the cars that will race at this summer's Silverstone Classic (20-22 July). Pictured leading the pack are a Formula 1 Tyrrell (centre), Group C Porsche sportscar (right) and Ford Sierra RS500 touring car (left).